Scott has 19 years of experience managing projects and conducting floristic inventories, quantitative flora surveys, plant community mapping, invasive species surveys and mapping, and plant species of concern surveys and mapping. He is experienced with setting up and conducting mitigation wetland monitoring projects and has conducted numerous aquatic plant surveys. Another aspect of Scott’s services is providing plant identification training workshops. In addition to his experience focused on the flora, Scott conducts wetland delineations and other site assessments and participates in avian and other wildlife surveys. Scott prepares natural area management plans and provides other technical writing services. 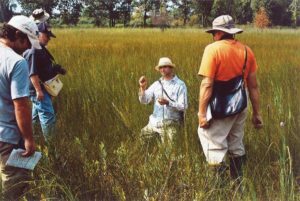 He is recognized for his expertise is in Midwestern/Great Lakes terrestrial and aquatic vascular plants, and his written work on the flora has appeared in several peer-reviewed journals including The Michigan Botanist, Phytoneuron, Proceedings of the Indiana Academy of Science, and Rhodora. Scott has presented research on various topics at numerous conferences. He currently serves as a board member for NatureCITE, Indiana Native Plant and Wildflower Society (North Chapter), and South Bend-Elkhart Audubon Society, and he is active with the Indiana Native Plant and Wildflower Society (Journal Team Leader) and the Indiana Academy of Science (member of the Biodiversity and Natural Areas Committee and previously Vice-chair and Chair of the Plant Systematics and Biodiversity section).